Tinea versicolor is a fungal infection of the skin that causes pink or pale discolored patches. 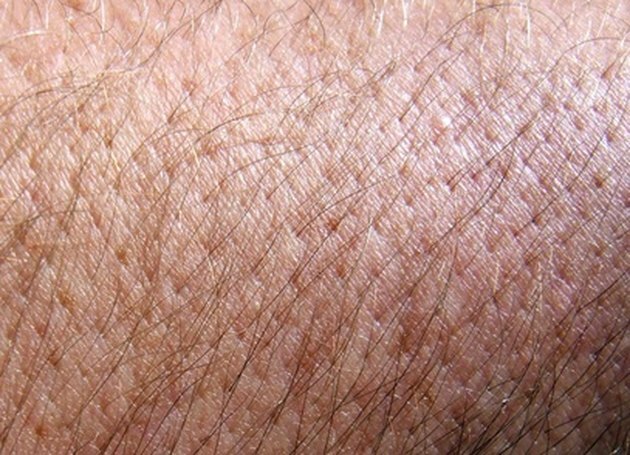 This area of skin irritation can become flaky and itchy. Several over-the-counter antifungal medications are available, which are effective at treating this skin infection. However, many fungal infections have a similar appearance, and a physician's diagnose will ensure that the proper fungal infection is being treated. Some people may not respond to topical antifungal medications and will then need to be prescribed a systemic medication by a physician. Selenium sulfide is available over-the-counter in Selsun Blue products. When applied topically, selenium sulfide inhibits fungi from reproducing, according to Drugs.com. Any adverse side effects, such as discoloration of the skin or hair, itching, or burning, should be reported to a physician as soon as possible. Clotrimazole is a topical antifungal preparation that can be purchased over-the-counter in brand names such as Lotrimin and Clotrim. Before using this medication, it is important to speak with a physician or pharmacist about your current medications, so that he may check for any drug interactions that may occur, according to Drugs.com. Miconazole is an antifungal medication that is available over-the-counter in a variety of products. It can be purchased as a spray, lotion, or powder, and is commonly found in Monistat-Derm, and Lotrimin AF. This antifungal preparation is effective against tinea versicolor with topical use in most cases, according to the Mayo Clinic. Terbinafine is an over-the-counter antifungal that is found in Lamisil and Lamisil AT. These products are for topical use and usually come in a lotion form. This antifungal is effective at killing a tinea versicolor infection, according to the Mayo Clinic.